Conquest, War, Famine & Death! Obviously, I’d greatly appreciate if you’d comment on/explain/justify your valuations & your long/short (as detailed, or as brief, as you wish). Ideally, this is the most interesting part of the exercise, so please share with other readers by responding via the Comments section of this post. [If you’re feeling bashful, please respond to wexboymail@yahoo.com instead, with an email titled ‘Four Horsemen’]. [And if by any chance, I’ve missed something here which needs obvious clarification, please comment/email me & I’ll post a comment/edit accordingly]. Ideally, please respond within the next week, as I’d like to publish a timely follow-up post. So go on, have a go…the more readers who participate, the more useful & interesting this challenge becomes. And remember, comments are anonymous (if you wish), and I certainly don’t intend singling out anybody in particular – well, unless they happen to really nail one (or more) of these companies’ actual market valuations! And please email/tweet/share this post & challenge with anybody else who might be interested in reading and/or participating. Thanks! Specifically, is this a recurring shortfall, or simply a once-off..?! I’d probably long Death/War and short Conquest/Famine if a gun was held to my head. Please NOTE the 01-Mar-2015 EDIT to my post above – now includes one final set of data points (Free Cash Flow vs. Adj Net Income over the Past 5 Years). Conquest – best growth potential but doesn’t have a long track record and has a decent amount of debt. Its stock price would probably be the highest but not fair value in my opinion. War – a a little less growth potential than Conquest, but a better debt position and a longer track record of earnings and growth. Famine – earnings have been shrinking or staying the same after dilution and income/interest ratio is tight. Death – Similar to war but with a little worse growth prospects. Would have no idea who to go long or short on until I saw stock prices. Thanks for preparing these – a fun exercise. I’m interested to see how low the valuations are, except for Fredrik’s. I’m intrigued by the difference, in all cases, between earnings and FCF and I would want to see the balance sheets and cash flow statements to understand this – are they investing, paying off debt, increasing debtors, what? I agree with Fredrik that the actual market cap of Famine is likely to be higher than this – though it depends on the sector and where the cycle is perceived as being. In fact I am going to guess that the actual market cap of all these companies is (a) greater than 1bn and (b) out of line with our valuations, because the market pays too little attention to debt. So I would expect Conquest to have the highest market cap of the four, even though none of us so far has given it the highest fair value. War and Death are both good long candidates; I would go for Death simply because its higher margins offer an element of safety against competitive pressure. War has demonstrated better growth recently, but the 10-year record is similar. Death looks like a stable, well-established business whose shareholders can sleep soundly. I would short Famine (if I shorted, which I don’t) because the low margins leave the company vulnerable and because the company seems to issue a lot of new shares (perhaps for acquisitions?) which reduces equity returns. It is the outlier among the group as regards long-term EPS growth. Quite a bit of variation to the valuations so far. I wonder how the average of our valuations will compare to the actual market caps. I definitely fit into the category of ‘you haven’t given us enough information’: I would want to see the detail of the balance sheets and cash flow statements to form more confident opinions. v) My long candidate is War. vi) My short candidate is Famine. Conquest – I assume an equity market cap of 26x FCF = 744mm (but adjusting for Net Debt and Pension Deficit – I get my own fair value target of 333mm. I do not necessarily agree that 26x FCF is a good investment – but I am taking into account an elevated equity market back drop! I assign a higher FCF multiple here because of a superior track record of revenue growth. War – I assume an equity market cap of 25x FCF = 707.5mm (but adjusting for Net Debt and Pension Deficit – I get my own fair value target of 461mm. I do not necessarily agree that 25x FCF is a good investment – but I am taking into account an elevated equity market back drop! 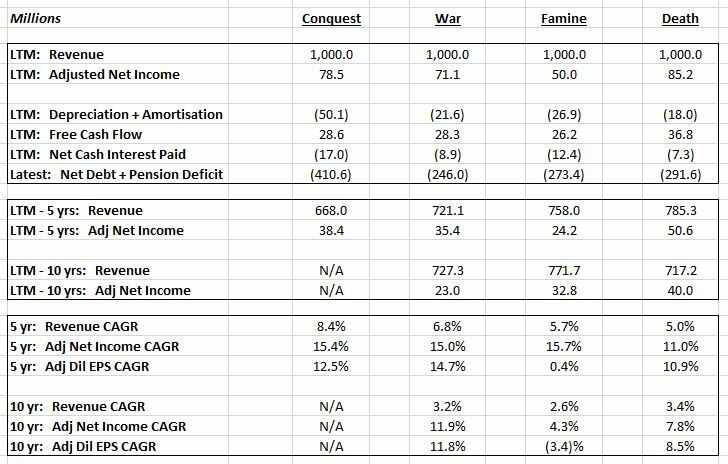 Famine – I assume an equity market cap of 24x FCF = 629mm (but adjusting for Net Debt and Pension Deficit – I get my own fair value target of 357mm. I do not necessarily agree that 24x FCF is a good investment – but I am taking into account an elevated equity market back drop! The FCF Multiple drops to account for the fact of lower revenue growth. Death – I assume an equity market cap of 23x FCF = 846mm (but adjusting for Net Debt and Pension Deficit – I get my own fair value target of 554mm. I do not necessarily agree that 23x FCF is a good investment – but I am taking into account an elevated equity market back drop! Again I assign a lower FCF multiple to account for lower revenue growth. Here are my valuations, they are based on DCF’s using conservative historical growth rates, and using FCF excluding interest to give an enterprise value then netting out the debt. My big assumption is that LTM FCF is indicative of the long term cash generation, I notice most are well below earnings, maybe it was an odd year for them all but I’ve assumed they reflect long term FCF yields. I expect these to be well below their actual market caps, firstly because the market doesn’t to care as much about debt, secondly I’m using FCF which is well below ‘earnings’ which would be more common for the market to use. Anyway, my short candidate would be Famine, easy pick for me as they clearly have diluted equity holders in the past and haven’t built any long term value. Debt pretty much wipes out equity if business gets in trouble. So let me make an *ss of myself.